Solar Hike is your pocket Solar and Lunar assistant. It worksoffline and you do not need an internet connection for getting toknow all the tiniest details about the Sun and the Moon. It Hasbuilt-in 250+ cities around the world for Solar and Lunar detailsand if your location is not in the listed cities, Solar Hike canget your location using your device's GPS. This application is alsouseful for travelers. It can help photographers for pre-shootingplan. It can help you install the solar panels in the rightdirection. 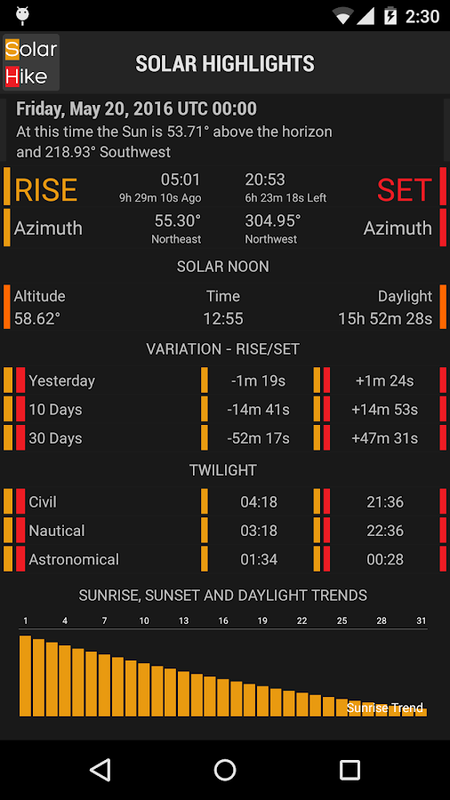 *** Highlighted Features *** Sunrise, Sunset, Azimuth,Altitude or Elevation, Direction, Daylight, Twilight, Variation inRise and Set, Moon rise and set, Moon Phases, Sun calendar, Mooncalendar, Compass, Solar compass, Lunar Compass. *** Other Features***User can get Sunrise and Sunset for a complete year.User can getTwilight for a complete year.User can get Sun's Position for acomplete day.User can export the result as CSV to send as an emailto anyone. The moon is a natural satellite of the Earth, which influences onhuman beings, animals, plants, tides..., and with this lunarcalendar can know their status.- Valid for the northern andsouthern hemisphere.- Check the status of the moon on any date,without any limit.- Know exactly what time enter the new or fullmoon.- Shows the percentage of moon visible from a certain day.-Alarm function to alert you when the moon enters a certain stage.-Languages: English, Spanish, French, German, Italian andPortuguese.